There are a host of apps available to those visiting Ibiza but this summer sees the launch of something a little different with a fantastic concept behind it. Updated: We believe this app is no longer available and await news re 2017. Called Ibiza 2016 the app utilises bluetooth and specially installed beacons to send you real time offers as you pass venues, bars and clubs ensuring that you hear about the best deals and special offers first. The app has several sections including an Ibiza news section for casual reading, venues by areas so you can always find that must place to eat or drink near by and a play button for Ibiza live radio. The offers are then split into two sections “offers” which gives you long term offers from various venues and locations which can easily be viewed before arriving on the island to help you plan your stay and of course make it that little bit cheaper. It’s also worth checking out daily as new offers are added regularly. 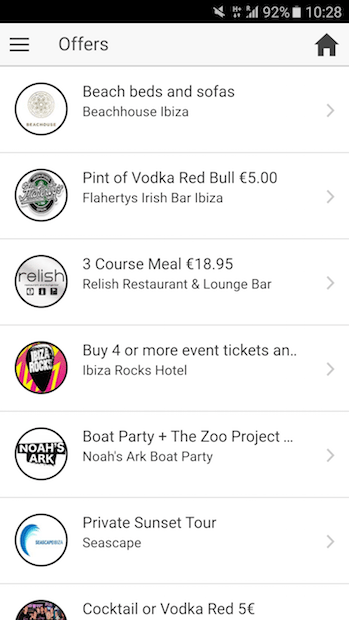 The next section “hot deals” is the clever part of the app and as you walk the streets of Ibiza passing venues bars and clubs they can send out real time offers to you without you having to hunt them out. Notifications on your phone pop up and you get the best deals on offer without having to search for them and maybe discover venues and bars you never normally would. From a business point of view its like having a virtual PR outside your premises 24 hours a day even when you are closed, meaning you can reach a greater number of potential clients across the season. You can send special offers, or time sensitive offers to cover the quieter periods of the day and build fantastic brand awareness without the need for advertising. The beacon does the work for you and offers can be changed at the touch of a button to suit the time of day or day of the week. This is a fantastic app to have for Ibiza 2016, not only will it save you a few euros with the extra information also available it is the perfect companion when you visit the island this year. Or you can follow them on Twitter here or FaceBook here.